I am not a particular fan of James Bond movies. I have seen the new movie with my son, and that was fun (my son loved it), but I prefer to listen to the music that John Barry composed for the early movies. And to all the music that is inspired by that music. And to all the rip offs, tributes, imitations, covers and other related songs. There must be people who really collect James Bond related music, but I just pick up whatever comes by, like the 45 that I mentioned yesterday. 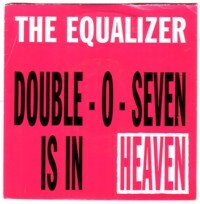 It is made by The Equalizer and named Double-O-Seven is in heaven . I can barely recognise the tune under the noisy synthesizer beats and if it weren’t a cover of this great theme I would never have bought it. I really don’t understand records like these. Not only because I don’t like house music (that might to some degree be considered a matter of taste), but just look at the sleeve: this lacks everything that makes life worth living. 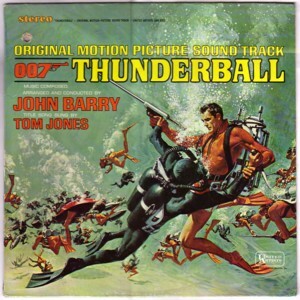 I just pulled out the soundtrack LP of Thunderball from the shelves and oh boy, what a difference. But let me not waste words on things I do not like. Luckily there are better James Bond related records that I happen to come by. Like the 6 inch flexi record that was given away with a special edition of the German magazine OK. There is no date on the record, but it must be from the early 70’s. 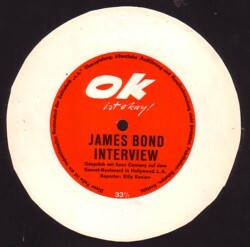 The label promises a James Bond interview, or in German: “Ein Gesprach mit Sean Connery auf dem Sunset-Boulevard in Hollywood, L.A., von Reporter Billy Kocian” . But it is not, of course, it is only a fake montage. Not that I care, I like fake montages too. Sean Connery gives a receipt for a goulash, but I would not try this at home, if I were you.